On November 7, 2018, Maine Preservation announced the winners of their 2018 Honor Awards, celebrating outstanding examples of historic preservation and revitalization statewide and recognizing the owners, professionals, preservationists and partners who make them possible. The 2018 Honor Awards, held at the Portland Country Club in Falmouth, recognized 13 projects and one family nominated earlier this year. The Lithgow Library in Augusta is one of the finest examples of Romanesque Revival architecture in Maine. Architects Joseph Ladd Neal, a Maine native, and his partner Alfred Hopkins were the proud winners of an 1893 design competition hosted by the Trustees of the Lithgow Library. In 2015, the Lithgow Library raised millions of dollars to undertake an extensive rehabilitation and expansion project. The restoration of the plaster, gilding, and paint colors has brought the room back to its stunning original appearance and complements the unaltered stained-glass windows and fireplace tile work. In 1881, the prominent businessman Amos O. Reed built a beautiful Italianate home on High Street in Brunswick. The Reeds lived in the house for almost 30 years before selling to the Drapeau family, who called it home for another 70 years. In 2011, Courtney and Donna Neff became the newest owners of this historic house, learning all about its past and completing a dramatic restoration of the house and the nearby. original carriage house. The Neffs have created a warm, inviting home with a new kitchen while maintaining and restoring its original historic character. Bowdoin’s first Director of Athletics, Dr. Frank Nathaniel Whittier, was honored in 1896 with the construction of Whittier Field, now part of the Whittier Field Athletic Complex. It is also the site of a 1972 Olympic Training Camp and the home track of the Olympic Gold Medal winner (and Bowdoin alumna) Joan Benoit Samuelsen. In 2017 Bowdoin College laid the groundwork for the rehabilitation of the track and Hubbard Grandstand by securing a National Register listing and restoring key historic elements of the Whittier Field Complex to one of the most storied collegiate football fields in America while preparing the facility to expand and flourish well into the 21st century. 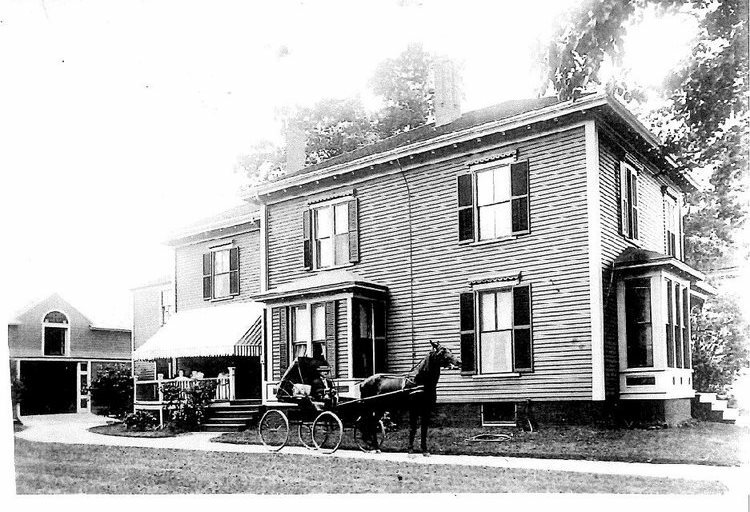 In 1907, Elizabeth Drowne gave a remarkable late 18th century house and 100 acres to the Town of Cumberland. The Georgian-style residence she inherited from her father, now known as the Prince-Drowne House, is believed to be the oldest surviving house in Cumberland today. Paul Moultal and Maryanne Burns recently acquired the property and with their amazing team of talented craftsmen at Flying Point Construction, turned a forlorn farmhouse into a stunning modern home that retains much of the original fabric. The newly reborn Prince-Drowne House is a testament to the power of innovative preservation, and a treasure that residents of Cumberland will admire for generations to come. On January 26, 1876, an extravagant gala was held to celebrate the brand-new Lincoln Hall. This two-story Italianate brick theater quickly became the social center of the Damariscotta community. In 2014, the Maine Development Foundation, in partnership with the Maine Community Foundation, awarded the Lincoln Theater funding through the “Grants to Green” program, leading to a complete energy audit of the building. As a result, the large windows became the main focus of repairs necessary for the theater to achieve a higher level of energy efficiency. With support from the Davis Family Foundation and community members, the window restoration project was set in motion, and Bagala Window Works restored the windows to increase energy efficiency and recapture the beauty of the original design. Just a few blocks from the flagship L.L. Bean store in Freeport sits an unassuming Queen Anne style house at 6 Holbrook Street. Built in the late 1880s for businessman F.W. Nichols and designed by noted Portland architect Francis Fassett. In 1912, the home was purchased by Leon L. Bean and his wife, Bertha. That same year, “L. L.” invented the iconic Maine Hunting Shoe, the product on which the company, L. L. Bean, was built. The Leon L. Bean Home had changed considerably over more than a century. With careful guidance from architects and consultants specializing in historic preservation; assistance from the Freeport Historical Society and the town’s Project Review Board; and information gleaned from family photographs, L. L. Bean decided to restore the building to the way it looked when the Bean family first occupied the house. As a result of this 12-year effort, the Leon L. Bean Home & Archive Center now offers an accurate glimpse into the life and times of Leon Bean and his family, and into the distinctive style of the Francis Fassett. On an eastern facing hill above Hallowell’s downtown, the Maine Industrial School for Girls was established by State officials as a place where so-called, “wayward girls,” between the ages of 7 and 18. The Administration Building at what came to be called Stevens School, was designed by Maine architect William R. Miller and constructed between 1905-06. Following closure of the Stevens School in the mid1970s, the buildings were repurposed for state offices. The state put the complex up for sale in 2003 and began moving offices off campus, but the site remained unsold until 2016, when it was purchased by Mastway Development, LLC. Most of the long vacant buildings, considered an eyesore by the community, suffered from neglect and considerable deferred maintenance. The Administration Building is the first rehabilitation project to be completed at the Stevens School campus, now known as Stevens Commons. Using state and federal historic tax credits, the building is now professional office space on the first floor with four apartments filling the upper stories. The Osgood Building is a four-story, white brick building that rises above Lisbon Street. Designed by J. Coburn and Sons, a local architecture firm, the Osgood Building was commissioned by Jeweler H. A. Osgood and clad with white English glazed bricks; no other examples of this construction material are known in Maine. Initially the offices of law firm Berman and Simmons occupied the second floor, but as the firm expanded it eventually purchased the entire building. The Osgood Building has now served as firm headquarters for over 100 years. 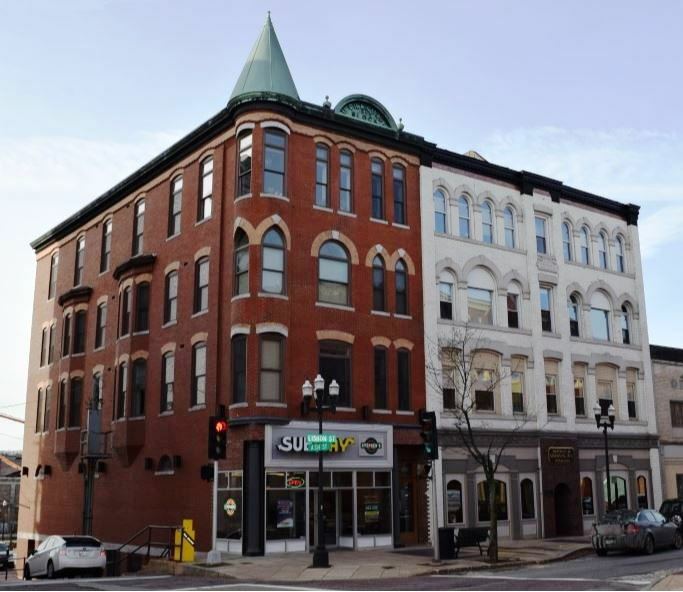 Working closely with SMRT Architects, P&G Masonry, Warren Construction Group and tax credit consultants Epsilon Associates, Inc. the Osgood Building was restored in a sensitive manner using the effective Maine Small Project Rehabilitation Tax Program. The project saved and revitalized a prized landmark on Lisbon Street, and added tremendous energy to Lewiston’s ongoing renaissance. Tucked between Franklin Arterial and the Portland Food Co-op the brick apartment building at 96 Federal Street has witnessed countless changes since it was built in 1867. Originally two stories tall and later topped by a third story, the building housed generations of European immigrant families. Unfortunately, heavy use throughout the 19th and 20th centuries took its toll; the building fell into disrepair and was eventually abandoned after the City of Portland condemned the rear porch. In 2015, Dan Black, and Max and Mariah Monks, purchased the building which was in extremely poor condition. The extensive stabilization necessary to rehabilitate this building brought together key public and private partners, including Chris Closs from Maine Preservation who served as their tax credit consultant, and illustrates the tremendous impact a small project can have on a historic neighborhood. The restoration of 96 Federal in the rapidly changing India Street Neighborhood, provided much-needed rental housing downtown while also serving as a catalyst for further neighborhood investment. Clark Memorial Methodist Church began as a small chapel built according to designs by John Calvin Stevens in 1857. The congregation thrived until the 1980s when membership started to decline. By 2015, the church was no longer financially viable and was marketed for sale. Hardypond Development Company, LLC purchased the property the following year, consulting with Maine Preservation to determine how best to re-use the sanctuary. Thanks to diligent planning and skilled subcontractors and designers, the construction of 25 market-rate apartments was finished ahead of schedule and the building leased in just three months– much faster than first anticipated. The success of the Clark Lofts on Pleasant project has been a huge boost to the continued revitalization of the Morrill’s Corner neighborhood. The dome of St. Joseph’s Convent, also called The Motherhouse (pictured in the featured photo at the top of this page), is visible for miles around Portland, and has stood as a prominent local landmark since its construction in 1909. Enlarged in phases, the three-story classical revival style brick building is ornamented with many beautiful features, including quoins, a detailed copper cornice, and the famous central entry tower topped by the copper cupola and Celtic cross. In the mid-1990s the Sisters of Mercy began their search for a new purpose for the Motherhouse, beginning a 20-year odyssey to identify an appropriate reuse plan that was economically feasible, sustainable and in keeping with their mission. This journey resulted in the $15 million rehabilitation of the Motherhouse into affordable senior housing. The building now contains 66 affordable and 22 market priced apartments for seniors. The Sisters of Mercy Motherhouse – a historic, enduring feature of Stevens Avenue, Deering Center and the greater Portland community – is preserved and revitalized to carry on the Sister’s mission of caring and community into a new century. In the 1920s the Portland Trolley Company decided to run a line to the amusement park and casino at Riverton Park, providing a key transportation link that led to the development of the Riverton area. By 1926, the neighborhood needed an elementary school to serve its growing population. The Reed School is named for Thomas B. Reed, a Portland native and an influential 19th Century US Congressman. The original building was designed in the Colonial Revival style and in 1960 a single-story addition was added with classrooms and an auditorium and gymnasium. The school remained in operation until 1980, when a larger facility was constructed nearby on Forest Avenue. The old Reed School was subsequently used as the central kitchen for the entire Portland school system until 2013, when it was vacated. The abandoned building fell subject to vandalism, and water, mold and rodent damage. To its credit, the City of Portland recognized the problem, and with the help of the community, developed a program for its reuse. Children’s Odyssey, a nonprofit providing structured programming for children of varied developmental levels, has moved into the recently rehabilitated 1960s section of the school. In Phase II, the 1926 building will accommodate 8 market rate apartments. With the help of an incredible team led by Developer’s Collaborative and Children’s Odyssey, and the use of historic tax credits, an important neighborhood structure will continue to serve as a community resource for decades to come. Built in 1769, the Dow Farm was purchased by the Dow family in the 18th century and remains in the ownership of descendants nearly 250 years later. The property was an active farm until the 1930s when the last generation of full-time Dow occupants passed on. From that point until 1974 the Dow family used the property as a summer getaway. In 1976, Donald Essman noticed the Dow house and, inspired by his strong interest in restoration carpentry, offered to serve as caretaker. The brother and sister who owned the house, Zelma Bryan and Claude White, allowed Don to move in and begin performing repairs in exchange for rent. Through the joint efforts of Don, Mike and the Dow descendants, the farm buildings and farmland have been lovingly brought back to life. The family owners of Sagadahoc Real Estate Association in Bath—were chosen as Maine Preservation’s 2018 Earle G. Shettleworth, Jr. Preservation Champion for their lifetime achievement in historic preservation. The Sagadahoc Real Estate Association, founded in 1887, has played an unparalleled role in the development and perpetuation of Bath as a vibrant historic commercial district. Brothers William and Oliver Moses established the association when they purchased several blocks and rebuilt them after the 1894 fire that damaged much of the coastal city’s downtown. In the mid-20th century the real estate association came under the control of the Morse family who continued to acquire and manage various properties. The ongoing prosperity of downtown Bath is due in large part to the Morses’ steadfast belief in historic preservation. They took great care to keep their 15 buildings, including whole blocks of Bath’s downtown, in excellent condition. Additionally, they felt it not only economically necessary, but morally important, to keep rental rates affordable for their tenants. They also went out of their way to understand the importance of a successful retail mix, moving beyond simply filling empty spaces and onto seeking new businesses who would reinforce the success of all of Bath’s downtown. As the family passes on their holdings to a new generation of owners, Maine Preservation honored their legacy, that has forever marked downtown Bath as a dynamic and authentic commercial district. All images courtesy of Maine Preservation.